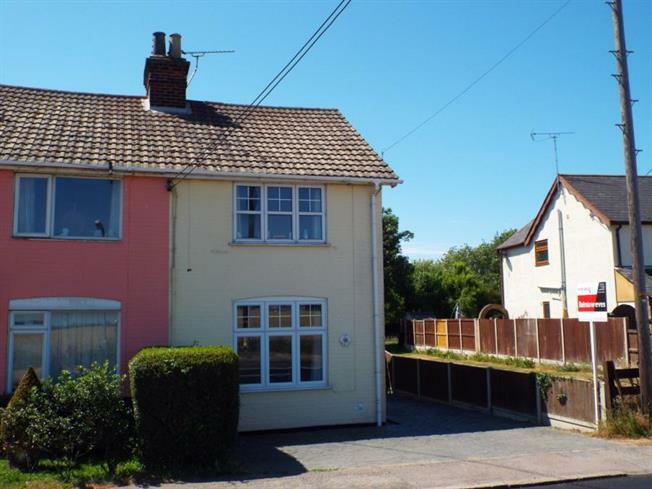 2 Bedroom Semi Detached House For Sale in Frinton-on-Sea for Asking Price £215,000. We are pleased to offer this extended two bedroom semi detached cottage which offers a wealth of charm and character throughout, the property has further accommodation comprising lounge, kitchen/dining room, utility room, bathroom, good size south facing rear garden and off road parking, the property is presented in lovely condition throughout and an internal viewing is highly recommended. Double glazed window to front overlooking open fields, radiator, ornate fireplace, tv point, telephone point and wood effect laminate flooring. With inset one and a half bowl sink unit, single drainer and mixer tap, cupboard below, further range of matching wall mounted and low level cupboards and drawers, roll top work surfaces, tiling to walls, built in double electric oven with seperate gas hob and extractor hood over, space for fridge/freezer, space and plumbing for dishwasher, double glazed window to rear overlooking the raer garden, radiator, tiled flooring and archway leading to the dining room. Double glazed windwo to side, brick built open fireplace with mantel over, built in storage cupboard and wood effect laminate flooring. Work surface with space and plumbing for washing machine below, space for tumble dryer, double glazed window to side and double glazed door leading to the rear garden. With fitted white suite comprising panelled bath with mixer tap and shower attachment over, wash hand basin, low level w.c, tiling to walls, double glazed window to side, radiator and tiled flooring. Double glazed window to front with views across open fields, radiator and fitted wardrobes to one wall with mirrored fronted doors. Double glazed window to rear, radiator and fitted wardrobe. The front garden is block paved providing off road parking and access via the side leading to the rear garden which commences with a patio area with the remainder laid to lawn and enclosed by fencing.